The same type concrete mixer in different concrete mixer manufacturer, the price is even different a lot. Today, Zhengzhou CamelWay Machinery will tell you the reason. You may ask why the price of same type concrete mixer is so different. This is because some manufacturer in the process of producing concrete mixer decrease the accessories of products and quality, to win the market at a low price. Different concrete mixer manufacturer to produce the concrete mixer use different materials, and the thickness and quality of the material are also not same. Such as the thickness of the lining plate, the quality of mixer shafts and reducer, and the material of the mixing blade. 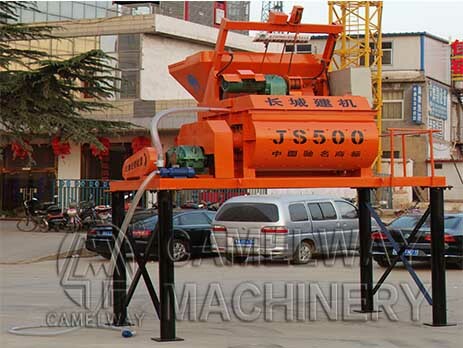 The quality of the equipment is different, so the price of concrete mixer is not similar. When you buy the concrete mixer, you had better to pay attention on the vulnerable parts. To choose the appropriate model and high quality concrete mixer rely on your demands. CamelWay Machinery produced concrete mixer will satisfy your different requirements. If you have any questions, you can make contact with us. This entry was posted in Solution and tagged concrete mixer by camelway. Bookmark the permalink. How to choose a host of concrete batching plant can achieve desired production efficiency?